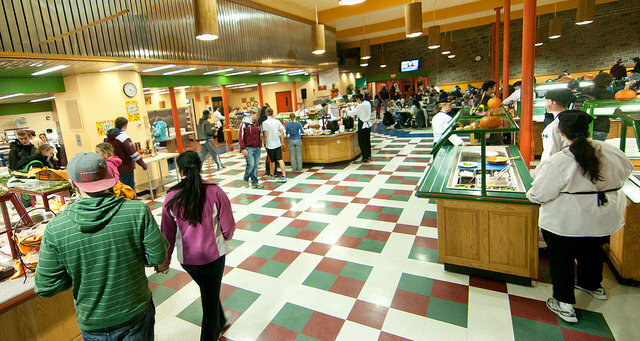 Located in the Northeast Residential Area, Worcester Dining Commons is one of the most popular dining facilities on campus. Featuring continuous, all-you-care-to-eat dining, you may dine at either Hillside or in the Oak Room. Offerings include many concepts: sushi, pho noodles, create-your own-stir-fry, pizza, dim sum brunch, pasta bar, Grab n’ Go, salad bar, deli station, American fare as well as Halal dining and much more. Worcester Dining Commons is handicapped accessible. Late Night Dining offers students one last chance to meet friends and have a snack (or an entire meal) before the day ends. Worcester Dining Commons is open until Midnight Sunday-Thursday, so there is plenty of time to sit, relax and reflect on the day.